A promotional piece for the upcoming MRA conference in October (we’ll be there so say hi if you’re going!) outlines a talk by Safe Harbor CEO Baxter Underwood called “Is the Marina Industry on the Brink of Institutionalizing?.” Using the example of the consolidation of ski hills in the 80’s, he argues that marinas are going through the same kind of transition today. With a few big players like Safe Harbor and Suntex snapping up marinas at a dizzying pace, and a lot of smaller regional players consolidating a half dozen or more local marinas, it’s hard to argue his point. Mr. Underwood is talking about institutionalization from the understandable perspective of someone leading the consolidation that we’re seeing in the industry. However, there are a few other factors driving this professionalization of the marina industry. For years most marinas have been run by a GM or dockmaster who keep most important customer and operational information in their heads. Many of these people are now getting close to the end of their careers. Marinas and boat clubs are facing the problem of how to transfer that knowledge from the individual to the organization. In the past this would mean an apprentice would spend a few years working under the current dockmaster before taking over. With the fluidity of the job market and people no longer expecting to stay with one employer for their careers this is no longer practical. This customer and institutional knowledge needs to live on with the organization, not the individual. The competition for people’s time and attention is also forcing marinas to up their game and professionalize. Marinas are no longer competing with the marina across the bay, they’re competing with social media, video games, Netflix and a mix of other “experiences.” In order to provide an experience that meets the convenience and service expectations of people who live digital lives marinas need to rethink how they communicate with and provide value to customers. Security has always been a focus of marinas given the value of not just the boats in the marina, but also what people have on their boats. In this data driven world security has also grown to encompass your customer’s data and your IT infrastructure. Every company has the responsibility to protect their customer’s data against ever more sophisticated threats. Data breaches and attacks on internal IT infrastructure can have serious long term legal and reputation implications for any organization. 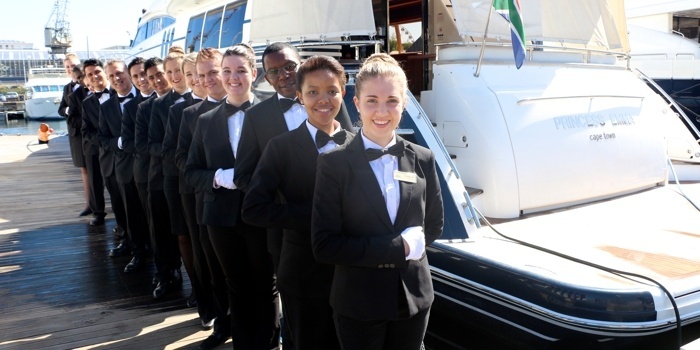 As customer service focused organizations marinas, waterfronts and boat clubs excel at hiring people with great attitudes, which is one of the things that make this such a great industry to service. Unfortunately nice isn’t enough any more. You need to make customers feel special. People feel special when you know who they are, how they like to be interacted with and what they like. A good customer relationship management (CRM) tool like Swell’s help staff members quickly pull up relevant information and personalize the customer interaction. Can you give them a treat for their dog? Were they out fishing last week and can you ask them if they caught anything? Do they race most Wednesday nights and you can ask them how they did? A great CRM also lets you communicate with customers in different ways like through mobile apps or text, as well as e-mail. A lot of the progressive marina managers that we talk to are doing this by embracing things like in-house boat or ski doo rentals, concierge services that prep a customer’s boat before they arrive at the marina and are embracing new technology enabled services like boat sharing, private owner charters and allowing customers to rent out their boats as accommodations on platforms like Airbnb. Keeping an open mind about new technology enabled services is important, as is testing things out to see what fits your market best. Branding starts with understanding positioning. Positioning is how you want people to think of your organization in relation to your competition and service offerings. A facility that is positioned as a value facility can get away with more spartan amenities. A mid-to-upper level market position involves meeting expectations with more service offerings and a fresher facility. Regardless of how you’re positioning yourself, a new paint job, clean new(ish) uniforms, updated logo, updated website and a reasonable level of grounds and facility maintenance all convey a professionalized organization. As we’ve written about, there are a lot of opportunities in a marina to dig deep in understanding how your customers spend money and opportunities to get more revenue out of your operations. For example, the average marina utilizes 83% of the available slip space and few take advantage of allowable overages that can be up to 15% of the length of the slip depending on local regulations and marina layout. That’s 1/3rd of potential slip revenue being left on the table in some cases! There isn’t enough space here to go into full details on all of the things you can do to professionalize the financial side of the business, but the starting point is digging deep on what you’re doing today, understanding what you don’t know or track, and then making a plan on how you’ll make improvements based on clear financial data. As discussed at the beginning, a lot of the operational and customer information in marinas and boat clubs is kept in employees heads. Finding a way to get that information in a codified, easily retrievable format is an important part of any organization’s professionalization efforts. Great marina management software with an attached CRM like Swell is the kind of tool you can use to move important customer and operational information from the individual to the organization. In a digital world there is an ever increasing legal and moral responsibility to protect your IT infrastructure and customer data. A disgruntled employee downloading all of your customer information, posting it online, or even worse selling it to criminals is a real threat today. Because most management software allows data export without tracking who’s doing it you probably won’t know who did it or when it was done. There are few quicker ways to have your brand tarnished and customer trust undermined than losing important customer information, not to mention the risk of litigation. Another serious threat is ransomware or other malicious computer programs. Ransomware is when a virus is downloaded to your computer system locking you out until a ransom is paid. The majority of the software used in the marina industry is hosted on in-house computers, or housed on private servers run by small IT and software companies. Unlike modern software-as-a-service such as Swell Advantage that runs on a major cloud provider like Amazon or Google with secure internet communication, these older programs are a serious security risk. In conclusion, the marina industry is consolidating and institutionalizing. This is raising the bar across the industry. There are a lot of great consultants out there who can help you. There are also a few new software systems like Swell Advantage that can help you align your financial health, customer service, data security and operational flow towards a healthier, more sustainable organization. We've built Swell Advantage not just based on countless hours spent in marinas and with the help of some of the top experts in the industry, but by copying industry leading products in other industries. These lessons, combined with cutting edge technology, allows us to provide you with a great tool to professionalize your operations. Give us a call at 888-908-7858 or e-mail info@swelladvantage.com to learn more.